Nagara Amavasya, or Nagar Amavasi, is the no moon day in the month of Ashada as per traditional calendar and Panchang followed in Karnataka and Andhra Pradesh. Nagara Amavasya 2019 date is August 1. Please note that some people refer to Amavasi as the new moon day. The Amavasya day is associated with the Nag Panchami that will be observed five days later. Special pujas are offered on the day at Naga Temples (Snake). Preparation for Nag Panchami festival begins in many regions from the day. The worship of Naga (serpent) god has been widely prevalent in coastal Karnataka since time immemorial. The Hindus offer prayers at the Naga Kallu (murtis of Nagas) placed under peepal trees (Naga Bana - grooves dedicated to serpent worship). 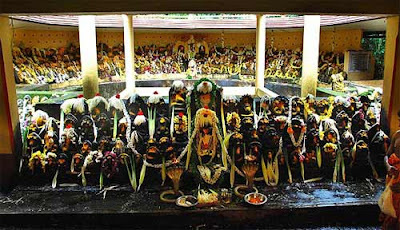 The Tulu speaking Hindu community of widely observe Nagara Amavasya. On the day, the figures of Nagas are drawn using turmeric and rice powder. In some cases, it is drawn using charcoal. Naga worship in this region is associated with Subrahmanya - son of Shiva - popularly known as Kartik or Muruga.